Q. Which El Pinto salsas and sauces are gluten free? A. 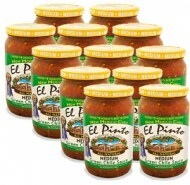 All El Pinto salsas and sauces are gluten free. We only produce our items in our factory so there is no chance for cross contamination with items that have gluten. Q. What is the difference between red chile sauce and enchilada sauce? A. There is not a difference between our red chile sauce and enchilada sauce. They are the same products. They have different names because outside of the southwest there are not a lot of people that are familiar with red chile sauce. It is known as enchilada sauce. Q. What are these black specs in my jar of salsa or sauce? A. El Pinto uses flame roasted and hand peeled green chiles in all of our products to get a delicious roasted flavor. We are the only brand that we know of that hand peels the chile. Most other companies used canned chiles or they steam peel their chiles. Steam peeling involves using and acid solution to dissolve any remaining peel. We work with our supplier every year to make improvements so there is less peel in the chile but it is impossible to get every last bit of peel. Q. How long are El Pinto salsas and sauces good for? Q. Can you ship to APO addresses or to different countries? A. We can ship to APO addresses and to other countries. The order will need to be completed over the telephone. You can contact Christine at 505-898-1771 ext. 132 and she can help you complete your order. Q. What happened to free shipping? A. We no longer offer free shipping as an ongoing promotion. We evaluated this promotion with increasing shipping costs and we simply could not sustain the promotion and make money. We will have different promotions and discounts for our products. You will get these promotions if you sign up for our newsletter at www.elpinto.com. Q. Why does it say Anaheim green chiles on the ingredient list? A. We would like to assure you that we do not use chile from California. We have had the same chile supplier since we started our company. We recently had our nutrition information reevaluated and the company that reevaluated it put Anaheim green chile in the ingredient statement. The Anaheim is actually the main name of green chile and then there is the New Mexico underneath that. Underneath that there are different types like the Sandia, Arizona19, Big Jim, etc. So all green chile is actually under the Anaheim category. Below is a link to an article with more information about it. Again, we do not get our chile from California and we have not changed our recipe. Look under the definitions for both the Anaheim chile and the New Mexico chile. Q. Do your products have onions? A. All of our salsas, red chile sauce, enchilada sauces, and roasted green chile are onion free. Our green chile sauces have a small amount of caramelized onions. Q. Why does the jarred salsa taste different from the restaurant salsa? A. Our jarred salsa tastes different from the restaurant salsa because the jarred salsa has to be cooked in the canning process. The restaurant salsa is not cooked. They both have the same ingredients. Q. Where can I find the nutrition information for your restaurant menu? Q. When is happy hour? A. Happy hour is Monday-Friday from 4:30 PM-6:30 PM. There is a special $3-$5 Happy Hour menu as well as $1.00 off all alcoholic beverages. A. El Pinto is open seven days a week. We are open Monday-Thursday from 11:00 AM-9:00 PM, Saturday and Sunday from 11:00 AM-10:00 PM, and Sunday from 10:30 AM-9:00 PM. There is Sunday brunch from 10:30 AM-2:00 PM. The lunch buffet is served Monday-Friday from 11:00 AM-2:00 PM. Q. I follow a gluten free diet. What can I order from your menu? A. There are a lot of things that can be ordered from El Pinto. We have a gluten free menu that has over twenty items on it. Let your server know that you follow a gluten free diet when you arrive. Q. I follow a vegan diet. Do you use meat stocks or lard? Q. I would like to buy a gift certificate and have it sent to someone. How can I do that? A. You can order a gift certificate in any amount. For your convienience you can purchase and send a gift card to yourself or as a gift through our online process. Simply Click Here for a Gift Certificate.